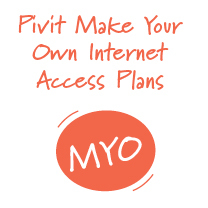 Pivit’s Make Your Own plans allow you the flexibility to choose the components that meet your needs. Click on one option from each plan component below, and your total monthly charge will be shown at the end . All Make Your Own plans have no excess usage charges. Please note the availability of your chosen speed is subject to a service check at your location. Some premises do not have suitable infrastructure to support your chosen speed. Pivit will confirm if your premises are not suitable at time of installation. For more details, please contact Pivit by email info@pivit.com.au to confirm the options available in your area. 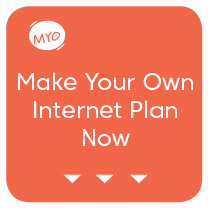 Make Your Own Plans are only available on Pivit networks. If you are not on a Pivit Network please check to see if we can provide you with plans on the NBN Network. 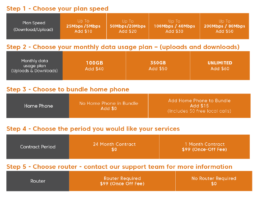 For Plans on the NBN network please see NBN plans.